At home on the Sofa. Billy remains very much more with us when we're out than Gypsy does - both of them make great use of the space in the field, but Billy's always running back to check with us, where Gypsy runs along the field edges taking a great interest. And at home, we're far more likely to be buried under a pile of Billy than under a pile of Gypsy! 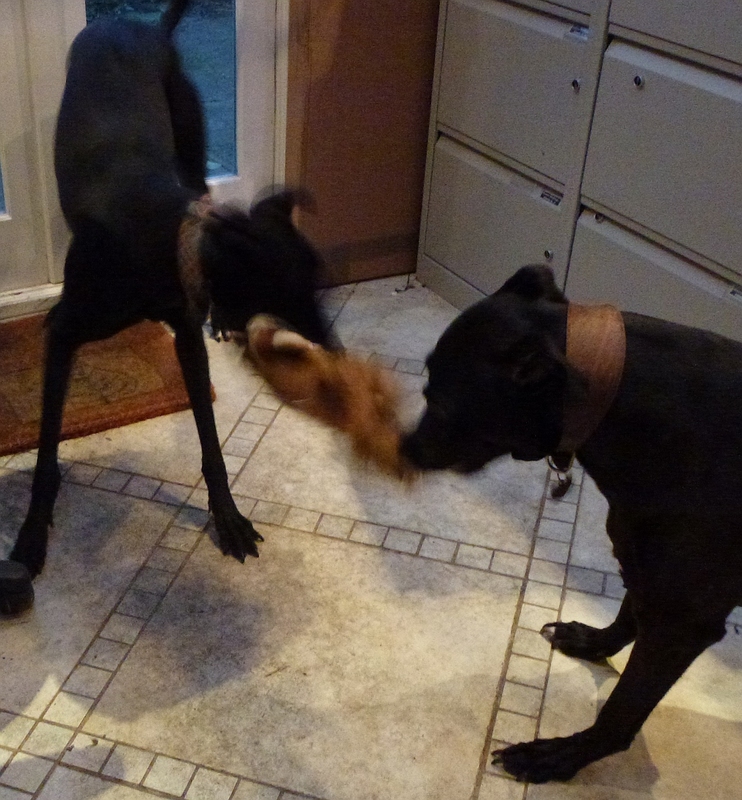 Billy's history has been that he's not been used to playing with other dogs, so this rather fuzzy picture of the two of them playing tug-of-war with a "roadkill" toy should warm the hearts of the folks of the Dogs Action Welfare Group. With such active dogs, it's so hard to capture the particular picture that's technically correct and shows what you want. 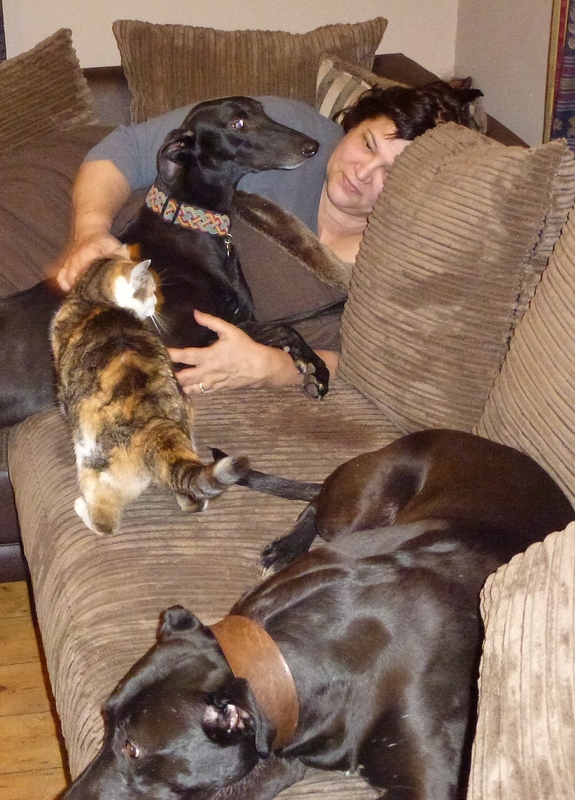 The two dogs are getting ever closer - our "pack" if you like, yet they're both so gentle so not really a pack. 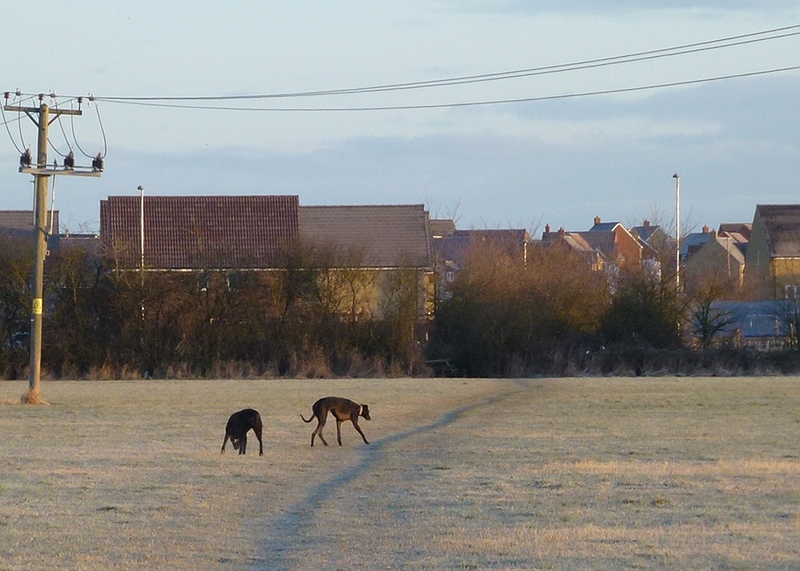 We do need to be careful when we're our with them off-lead as they'll run up to people they don't know and it's rather daunting to have a couple of very fast dogs bounding up to you. We know they're just saying "hello", but others may not. If you're looking to adopt a dog, I would recommend you consider a "sighthound" - that's a greyhound / whippet / lurcher type. They're not really a type of dog I would have even thought of in the past but - wow - they're do right for the right person or family. You need some space. You need to enjoy walks - but if you have grassy parks or fields where they can be let off the lead, those need not be long walks for you. You need to have someone around most of the time. And you need a heart. I visited the Bristol Dogs Action Welfare Group web site before I posted today, and - gosh - yet more dogs looking for loving homes. Billy was a "special appeal" dog and I see that Harry has now moved into his shoes. Have a look - Special Appeal - Harry. I hope that turns into a broken link soon - because that will mean that another lovely dog has found a loving, permanent home.